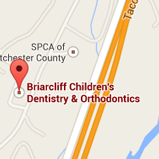 Our practice is committed to providing you and your family with safe, gentle, and high-quality dental care. 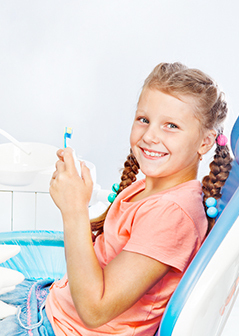 We understand your child may feel anxious about visiting the dentist. We are sensitive to children's needs and it is our goal to make everyone feel comfortable visiting our practice while providing them with the best possible care. Our focus is on your child's comfort, happiness, and health. After the checkup and teeth cleaning are complete, the doctor will meet with you and your child for a consultation. We'll discuss X-rays, help create an individual treatment plan, review oral home care including proper toothbrushing and flossing instructions, and discuss the role of diet and nutrition on dental health. The doctor will also address any specific questions you may have about dental or orthodontic issues. The American Academy of Pediatric Dentistry recommends that children visit the dentist every six months for regular checkups and routine teeth cleanings to keep their teeth and gums healthy. We understand your family has a busy schedule, so when you're preparing for a dental visit, please remember an appointment can last between 20 to 40 minutes. Your first visit to our office will be a free exam for you or your child. Dr. Guerra will carefully examine the teeth for a wide range of possible orthodontic problems, such as crowding, cross-bite, gaps, etc. Once Dr. Guerra has a clear picture of the most likely course of treatment she will discuss what type of treatment is necessary, how long it will take and estimate how much it will cost. You’ll understand everything you need to know in order to decide whether to proceed with treatment. Dr. Guerra may recommend monitoring your child’s growth and development over a period of months or even years before treatment starts. After Dr. Guerra has thoroughly evaluated the diagnostic records, she’ll explain your treatment to you in detail including the cost for your particular case. After the records appointment, we'll be ready to schedule an appointment to have your new appliances (braces, expanders, etc.) placed. That process usually takes one to two hours. You’ll then see us at regular intervals of four to eight weeks for adjustments, which take about 15 to 30 minutes. Patients are seen by appointment only. We make every effort to be on time for our patients and ask you to extend the same courtesy to us. If you cannot keep an appointment, please notify us immediately.